Filled with lightweight insulation, the Nike AeroLoft Jacket helps you stay warm during chilly rounds. Its knit fabric is soft and quiet, an update that reduces noise while you're on the course. LIGHTWEIGHT WARMTH FOR PREMIUM PERFORMANCE. Filled with lightweight insulation, the Nike AeroLoft Jacket helps you stay warm during chilly rounds. Its knit fabric is soft and quiet, an update that reduces noise while you&apos;re on the course. 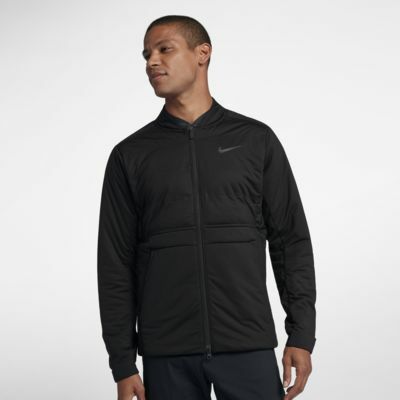 Nike AeroLoft technology integrates warmth with ventilation. Updated insulation is more lightweight through the sleeves adding extra warmth without impeding your mobility. Knit fabric is soft, quiet and stretchy to help minimize noise and maximize comfort throughout your round. Water-repellent finish helps you stay dry in wet conditions. Laser perforations add ventilation in high-heat areas. Really love this jacket, but the sleeve tore at the seam which was disappointing. Soft and quiet. Not sure if I had a defective batch or if the jacket design is flawed.